It's no surprise that Triangl Swimwear has taken over social media. The exposure they gain from sites such as Pinterest, Tumblr, Twitter, and Instagram (@triangl_swimwear) alone has allowed their products to become so highly coveted. I, myself, discovered Triangl through these social medias and it was the photos that sold me to purchase my very first one a couple of months ago. I fell in love with the simplicity of the design, the vibrant colors, and the way it just fit the bodies of the girls that wore them. Read more to get a full review of the Triangl bikinis that I have, the Chloe and the Tilly. Maybe it'll give you that extra push to order one of your own! Saturday reached the mid 80s, a beautiful day to be out and about. While wandering around The Bushwick Collective, it took a while to find the right graffiti-covered wall to use as a backdrop for my photos, but Marco and I finally decided on this black and white piece against a brick wall. I paired my powder blue tank by Wilfred Free with my super light wash TNA denim shorts from Aritzia. To balance those light shades of blue, I decided to put my Saint Laurent Classic Y Clutch to good use along with my white and gold Dolce Vita's. As you can tell, I'm a casual dresser. My outfit needs to be comfortable, first and foremost. I find that dressing for the summer can be quite challenging because you try to balance looking cute with an outfit that will allow you to stay cool but doesn't share way too much skin either. Read more to check out more photos from this day and other details about this outfit! Finding the perfect plaid shirt has always been a struggle for me. Either the grids weren't right, the colors were no good, or the material was just cheap or too thick. Lucky for me, my patience had paid off when I came across the Wilfred Free Rollinson Blouse from Aritzia which you can find here. I paired it with a plain white tank from Nordstrom and my scuba leggings from Forever 21. I love being comfortable in an outfit, not having to worry or fuss about any straps, something being too tight, too loose, etc. 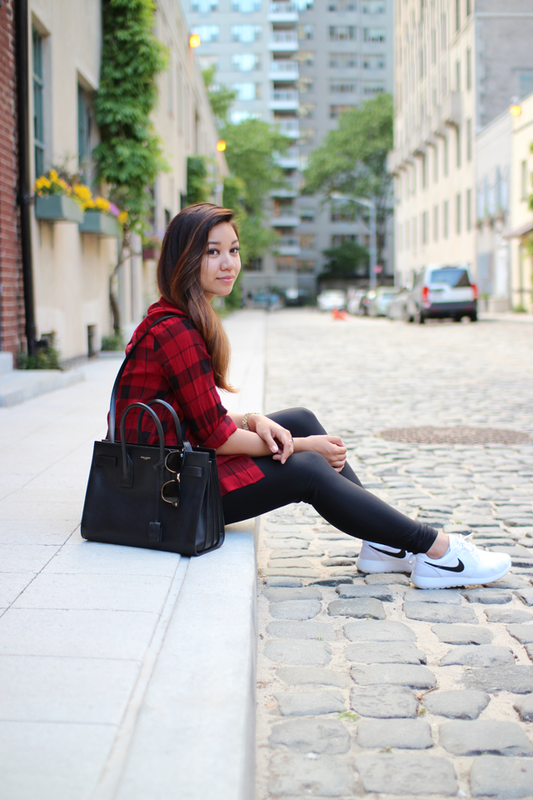 An afternoon strolling through Greenwich Village called for something a little more cool and casual. Since the sun was already setting, I figured a good leggings/button down combo was the perfect match for this time of the day. Read more to get the full details of this outfit and shop similar items below!